Cobalt-mining companies have been pleased to see the market continue thriving in 2018, driven by demand for lithium-ion batteries, which are used to power electric vehicles. As these vehicles become more common, increasing amounts of lithium, cobalt, graphite and other metals will be required to meet demand. Unfortunately, sourcing cobalt is tricky, largely because the more than half of the world’s cobalt production comes from the volatile Democratic Republic of Congo (DRC). What’s more, about 60 percent of cobalt production is a by-product of copper. With those factors in mind, here’s a look at the five top cobalt-mining companies in the world, as per data from the SNL Metals & Mining database. Glencore is the world’s largest cobalt-mining company by a long shot, achieving total production of 27,400 tonnes in 2017. 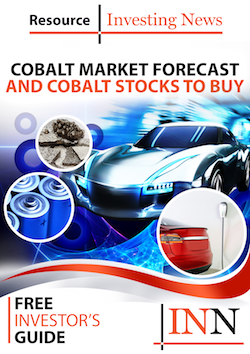 According to the Financial Times, the company is aiming to increase its cobalt output to 63,000 tonnes by 2020. To do so, Glencore has been taking steps to increase its presence in the cobalt space. It upped its involvement in the cobalt and copper markets last year, paying Fleurette Group $960 million for its stakes in Mutanda Mining and Katanga Mining (TSX:KAT), both located in the DRC. China Molybdenum, which is partially owned by the Chinese government, produced a total of 16,419 tonnes of cobalt in 2017. In 2017, the cobalt-mining company paid Freeport Cobalt $2.65 billion for its 70-percent stake in TF Holdings, which indirectly owns 80 percent of the Tenke Fungurume mine in the DRC. The mine has one of the world’s largest concentrations of cobalt and offers “security of supply of a critical battery material for decades to come.” Traders say most of Tenke Fungurume’s output is consumed by China. Until last year, Fleurette Group held stakes in Mutanda Mining and Katanga Mining, both of which are cobalt-producing operations in the DRC. However, as mentioned, Fleurette Group has now sold its interests in both properties to Glencore. Glencore now owns all of Mutanda Mining and about 86.33 percent of Katanga Mining. Fleurette Group put out a total of 7,595 tonnes of cobalt in 2016. The company’s website is under construction, and numbers for 2017 are not available. It is unclear whether the firm will remain a top cobalt producer now that its interests in Mutanda Mining and Katanga Mining have been sold. Vale produced 5,811 tonnes of cobalt in 2017. The cobalt-mining company reported net operating revenues of $33.967 billion that year, 24 percent higher than in 2016. A large percentage of sales, 41 to be exact, went to China. In Canada, Vale is active in Ontario’s Sudbury Basin; together, six underground mines produce mainly nickel, but also copper, cobalt, PGMs, gold and silver. The company’s Thompson Complex, located in Manitoba, also produces cobalt, although nickel is the primary metal mined. Additionally, Vale operates the Goro open-pit mine in New Caledonia, where it produces cobalt as a by-product of nickel. The company has been trying to sell a 20- to 40-percent stake in the asset, but so far there have been no high bidders. The mine has been plagued with “technical setbacks, a chemical spill and violent protests by locals,” as per Reuters. The latest quarterly results from the asset show a 36-percent drop in profit, further incentivizing the sale. Gecamines, a state-controlled cobalt-mining company in the DRC, produced 4,167 tonnes of cobalt in 2016. Its 2017 numbers have yet to be released. The Investing News Network has reached out to Gecamines for its latest figures, but has yet to hear back. The company has minority interests in a number of major DRC mines, with companies such as Glencore, US-based Freeport-McMoRan (NYSE:FCX) and Canada’s Ivanhoe Mines (TSX:IVN) having controlling stakes and operating the projects. In November 2017, Bloomberg covered a report that claims nearly $750 million is missing from Gecamines’ accounts. The funds were paid by its international partners, but they don’t appear in the company’s books. The cobalt-mining company has faced criticism in recent years from the International Monetary Fund and advocacy groups for selling assets in non-transparent procedures. Late last year, Gecamines also found itself in the midst of two court battles. Back in March of that year, the company was found to have “blocked its 16-year partner GTL’s access” to a key mine in the DRC in order to “make way for a new investor.” The failed partner swap resulted in two disgruntled parties, GTL and Shamrock Global. Investors will have to wait and see how these cases conclude. More recently, Gecamines has sought the dissolution of Kamoto Copper Company, a subsidiary of Katanga Mining, “over what it says was Glencore’s failure to address a capital shortfall … for more than a decade.” After reaching the Supreme Court of the DRC, the case was settled between the parties, who agreed on a recapitalization plan that will satisfy the capital deficiency that Gecamines opposed. Which cobalt-mining company would you invest in? Tell us which one and why in the comments. What has become of the cobalt resources in Cobalt, Ontario; an important silver mining center about 80 years ago, with cobalt, I believe, as a waste by-product (at the time)?